A powerful artifact known as 99Vidas has gone missing and it is up to the guardians of the 99Vidas to find it and keep it safe before it falls into the wrong hands. Can you stop the world from falling into Chaos? It’s time for our 99Vidas – Definitive Edition review. Developed by indie game developers QUByte Interactive, 99 Vidas was created in 2015 in partnership with Brazilian Gaming Podcast 99Vidas. Prior to becoming a crowdfunding campaign, A demo of the game was created using the Unity engine to show backers the concept behind the game. The project goal was to reach R$80,000.00 Brazilian Reals ($20,689.60 USD) to help fund development to publish the game on STEAM. The project successfully reached a grand total of R$127,309.78 ($32,924.86 USD) and enabled the QUByte Interactive to develop and publish 99Vidas for PlayStation 3, PlayStation 4, PlayStation Vita and Xbox One as well. The game released on Steam in December 2016 and released on consoles in July 2017. Nearly 2 years since it’s release on STEAM, it is now the Nintendo Switch’s turn to take the game for a spin and with a definitive edition to boot. 99Vidas – Definitive Edition is heavily inspired by arcade fighting games of the ’80s and ’90s. It’s plot centers around the four guardians of the 99Vidas in a fictional anachronic universe. The four guardians are bound to the artifact and have lived through the ages to protect it. When the artifact goes missing, King, Izzy, Fries and Oak! venture out to find the Artifact before the Evil Boss and his six henchmen do and bring chaos upon the world. The game is done in 16-bit graphics to remain faithful to the original arcade brawler games that 99Vidas was inspired by. The style is very well done and is a very colourful game to look at. A lot of attention went into creating the many sprites that spawn in-game and are easily identifiable from the food items to the video game consoles that you can find hidden in crates. The music and sound effects are very reminiscent of the old 16-bit games as well, the music in particular, is very funky and upbeat as you would expect for these types of action brawlers. The gameplay of 99Vidas – Definitive Edition is simple enough. Make your way from the left side of the screen to the right side and ultimately to the end of the level whilst fighting everyone in your way. At the end, you will have a mini-boss to fight with a weakness that you will need to exploit. Along the way, you can find health pick-ups like apples, bananas and the occasional roast chicken. You can also find weapons like pipes, bottles and baseball bats to use temporarily on the hordes of baddies that just want to rough you up. There are several types of enemies that each have their own style of attack. Some have alternate sprites with different colours to add a little more variety so that players aren’t just met with waves of the same coloured clones, over and over again. In order to progress in each stage, you have to defeat all the enemies on screen. You will earn cash for defeating baddies and can earn more if you pick up video game consoles from crates. The cash can then be used between stages to purchase new moves, improve old ones or buy extra lives. There are 11 playable characters but only 6 are available to play with from the start. The other 5 can be unlocked via multiple playthroughs. There are 5 Game modes including Arcade, Story, Remix, Versus and Survival. They are pretty much just rehashes of each other and offer no real change of pace. The Versus mode only differs as it pits players against each other as opposed to working together. Survival also differs in the way that you are in a single area fighting off waves and waves of enemies until you are eventually defeated. Story mode has players venture through each of the 7 stages to fight the evil Boss and his henchmen. Each stage has a slightly different aesthetic from each other like the slums along the beach, the red light district and even in an aquarium. Extra levels can also be played if you pick up the sketchbook. When you finish the stage you are on, you will be able to play in a unique “hand drawn” stage that takes place of pages of sketch paper with pens and other stationery lying on top of them. For the achievement junkies among you, there are plenty for you to try and achieve in this game. There is a fair number you can unlock just by playing through the game. Other achievements take require players to perform certain tasks like picking up a food item within five seconds of breaking the crate. Not all achievements are visible from the start and require some experimentation. There is also an Extras feature with a gallery mode that displays some of 99Vidas concept art. It is a nice touch that shows the work and dedication that went into making the game. Aside from the four local modes, there is an online mode as well. You can play with others in different parts of the world. Unfortunately, there never seems to be anyone else online to play with so you can be waiting for an exceptionally long time and not play a single game. It is a shame as there is certainly more fun to have when playing with others. An online mode is a nice touch as it allows plays all over the world to play with each other. The problem is that without a big enough community surrounding the game, matchmaking becomes more difficult as there are not enough players online to play each other and it only needs two to start up an online game. Controls are simple enough, the Joystick moves your character around the screen. The A, X and Y buttons are used to attack and jump. Y is the punch button, X is to kick and A is the super attack. The super attack has two forms depending on how full your super meter is. If it is over halfway, you will unleash a powerful attack on surrounding enemies. When the meter is full, you administer an even more powerful attack. You can fill it up by defeating enemies. The B is the Jump button. you can also attack when in the air and can either temporarily stun or knock down opponents. You can string together combos as well through a series of punches and kicks, depending on if you have unlocked said combo. Each character has a special element attack (Fire, Water, Earth, Air, Thunder) as well that, once purchased, will help player do a bit more damage. You also have a blitz attack that you can charge into enemies by pressing the joystick twice either left or right to run and then follow up with an attack (punch or kick), If you get surrounded you can also unleash a special attack at the cost of health to throw back your attackers (R button or X and B pressed together). With the exception of the blitz combo, the other controls are reasonably responsive. The blitz combo isn’t difficult to do but it does require some space from enemies, otherwise they can hit you and cancel your attack before you can successfully pull it off. You can use both Joy-Cons and the Pro Controller depending on your play style. You will also be prompted on multiple occasions on what devices you are using. If you are playing on your own in handheld mode, you can easily press the B button to cancel and continue to play in handheld mode. 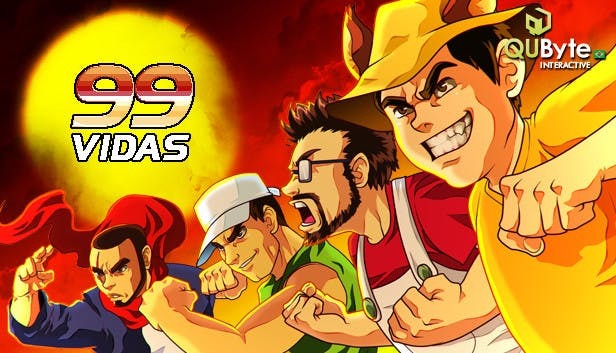 99Vidas – Definitive Edition is a nice enough game to play but it is better to play with friends than it is alone. Not that you can’t play it on your own, you can still have a nice enough time. However, at least with other people you can break up the repetition much easier but changing it up every once and a while. The combos are the same for all characters so playing as the same character can get a little boring and you can end up spamming the same combo over and over again. At least when playing with friends, you can swap Joy-Cons and get a feel for another character that has a different combo animation and at least feels like it’s something different. A nice enough romp with a little variety that you might break out on occasion when you have friends over. There are so many arcade brawlers on Switch now that it is hard to justify adding another to the roster. While fans of the STEAM, PS3 and PS4 version may double dip for the extra feature of playing on the go, they most likely have double dipped when the game was on PS Vita. The price tag of $9.99 isn’t steep for a game of this calibre but with so many other games on Switch that offer the same and more, 99Vidas – Definitive Edition may struggle to find firm footing on Switch owners’ consoles.